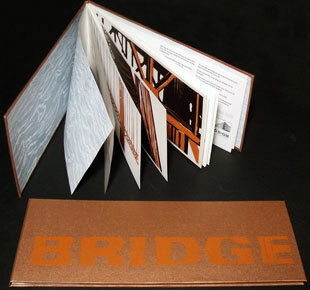 Thomas Parker Williams: " I started to make artist books in 1998. They are all handmade using various printing and cutting techniques." Philadelphia, Pennsylvania: Thomas Parker Williams, 2016. Edition of 4. 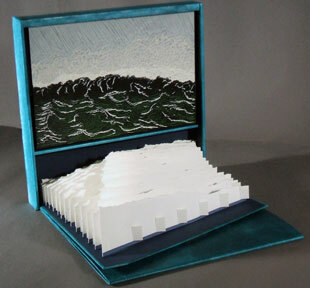 Movable paper sculpture: 4.75 x 9.25 x 9.75" closed, 18" fully open. Includes 12 page book. Materials: black Tyvek, magnets, museum board. Designed with 3D CAD software. 145 unique parts cut and assembled by hand. Ribs, base and box constructed of museum board. Various papers used for the panels and hinges. Hinge connectors and binding material black Tyvek. Covers of the storage box and accompanying book letterpress printed from polymer plates. Thomas Parker Williams: "The Paper Sculpture is a movable book made of 145 unique cut paper parts bound with black Tyvek. Mounted on a six-part folding base, the book fits into a storage box. The 145 unique parts include 19 ribs, 18 double hinge sets, and 108 exterior panels that form 18 sections. The starting rib is permanently fixed to the base. To facilitate display, ribs 4, 7, 10, 13, 16 and 19 contain magnets that connect with steel contact points on the base. 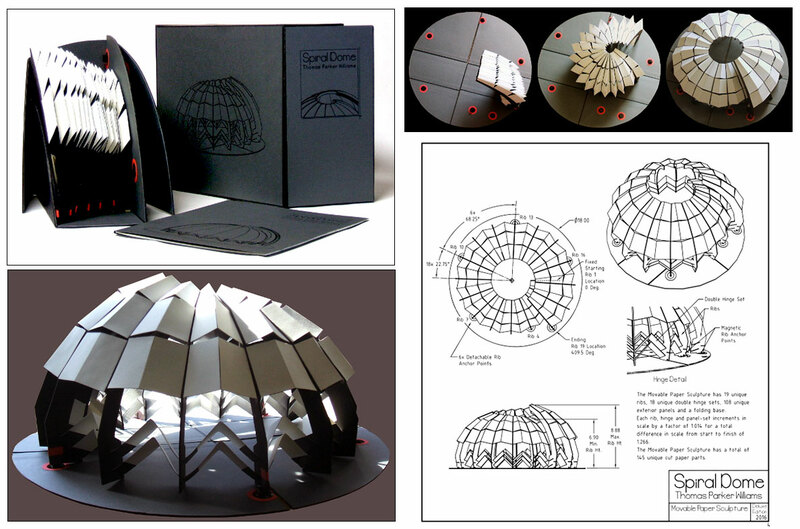 "While working on the Spiral Dome Movable Paper Sculpture … I realized it could function as a model for a permanent installation, which I call the Proposed Steel Sculpture. I made preliminary drawings for constructing such a structure. It is illustrated on the cover of the book. "To create the spiral in both models, 18 sections increment in height and dimension from the center of the structure by a factor of 1.014 for each successive section. The last section differs in scale from the first by a factor of 1.2666, or 1.014 to the 17th power. All elements in both sculptures – ribs, hinges or braces, and panels – increment by the same scale factor, as shown in the drawings in the book. "Spiral Dome was inspired by James Turrell's Skyspaces, enclosed chambers with apertures for viewing the sky. The Proposed Steel Sculpture functions similarly, but because the opening results from a spiral, the Dome will also capture direct solar rays as the sun moves across the sky. A drawing tracks two possible solar paths when the Dome is oriented to the south and sited at the stated latitude and longitude. With the sun low in the sky at the Winter Solstice, its path would be viewed near the top of the Dome. At the Summer Solstice, the sun's path progresses on the floor of the structure. Many sun-and-shadow patterns will be created as solar rays are projected and reflected inside the Spiral Dome throughout the year." Philadelphia, Pennsylvania: Thomas Parker Williams, 2015. Edition of 11. 6 x 10 x 1" in case, extends to 19" diameter. Digital prints of 24 original painted panels. 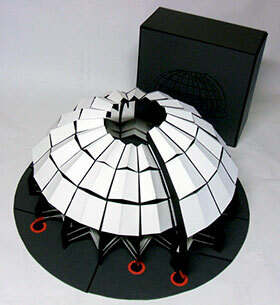 Arranged in a circular accordion structure with 12 double-sided sections. Tyvek hinges. Companion video (8 minutes 23 seconds) on DVD. Signed and numbered by the artist. Thomas Parker Williams: "Prints of twenty-four painted panels, executed with dry pigments in alkyd medium, represent events affecting our environment and actions exacerbating these events. Each panel is divided into two sections to give two possible visual interpretations. 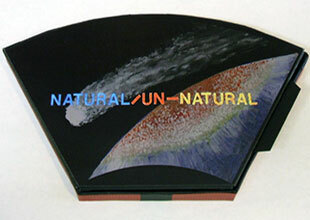 "Events described by the panels are: extra-terrestrial impacts, solar storms, volcanic activity, eruptions, earthquakes, tsunamis, wind, dust storms, rain, flooding, hurricanes, storm surges, tornadoes, blizzards, drought, wildfires, earth shifting events, glacier melting and calving, permafrost melting, and sea level rise. "The climate is changing, we cannot control the events that threaten our environment but we could have controlled our actions. "Now we may be powerless to stop this process." Philadelphia, Pennsylvania: Thomas Parker Williams, 2015. Edition of 2. 6.25 x 7.25 x 7.5" closed, 13.5 x 20 x 2.8" fully open. Dodecahedron structure. Exterior panels of embossed copper sheet with patina. Twelve paintings in alkyd medium and dry pigments on paper structures outlined with Venetian marbled paper. Digitally printed text. 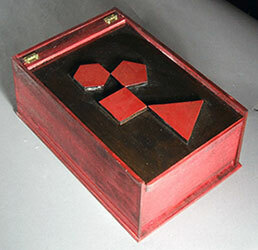 Housed in painted wooden box with cradle and magnets to hold sculpture in place. Colophon sheet laid in. Signed and numbered by the artist. Thomas Parker Williams: "Vessel of Secrets was inspired by 'The Nature of Things' written c. 50 BC by the Roman philosopher and poet Lucretius. 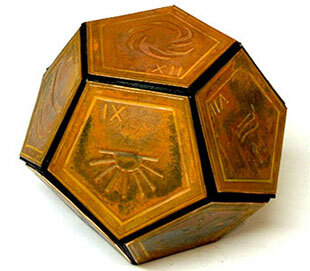 "The shape of this vessel is a dodecahedron, a twelve-sided perfect solid, which represented the universe in the ancient world. From 'The Nature of Things' I distilled twelve ideas, or secrets, I consider to represent some of the fundamental ways the universe functions. The ideas deal with the physical sciences, biology and philosophy, and are personal observations. "Each of the twelve secrets is represented by an embossed copper plate on the exterior of the structure and a paper pyramid supporting a miniature painting on the interior of each side. The rear of each pyramid structure contains the text of the secret. "The structure is held closed by small powerful magnets and can be easily opened when rotated to the proper angle. Once opened the entire structure can be flattened for display or partially flattened to show exterior and interior surfaces." Philadelphia, Pennsylvania: Luminice Press, 2014. Edition of 25. 7.25 x 7.25"closed ; 10 pages forming five openings plus colophon on separate circular page. Slipped in matching case. 11 multi-color relief prints from hand cut plates. Hand printed on the Luminice hydraulic platen press on Mohawk Superfine cover stock. Black cover stock binding with black Tyvek hinges. Design, printing and biding by Thomas Parker Williams. Signed and numbered by the artist. Thomas Parker Williams: "Color Code is based on the electronic color code for components such as resistors and capacitors. 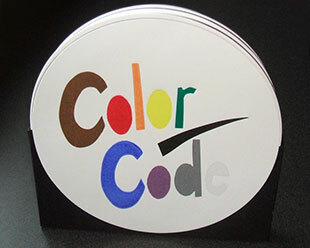 The colors indicate numerical values: 1 – brown, 2 – red, 3 – orange, 4 – yellow, 5 – green, 6 – blue, 7 – violet, 8 – gray, 9 – white, and 0 – black. "Each panel is attached to the structure with a radial hinge so that the panels can be rotated 360 degrees independent of each other. " Drawings and bindings by Thomas Parker Williams. Pinhole photographs and silver gelatin prints by Mary Agnes Williams. Signed by photographer and binder. Numbered. 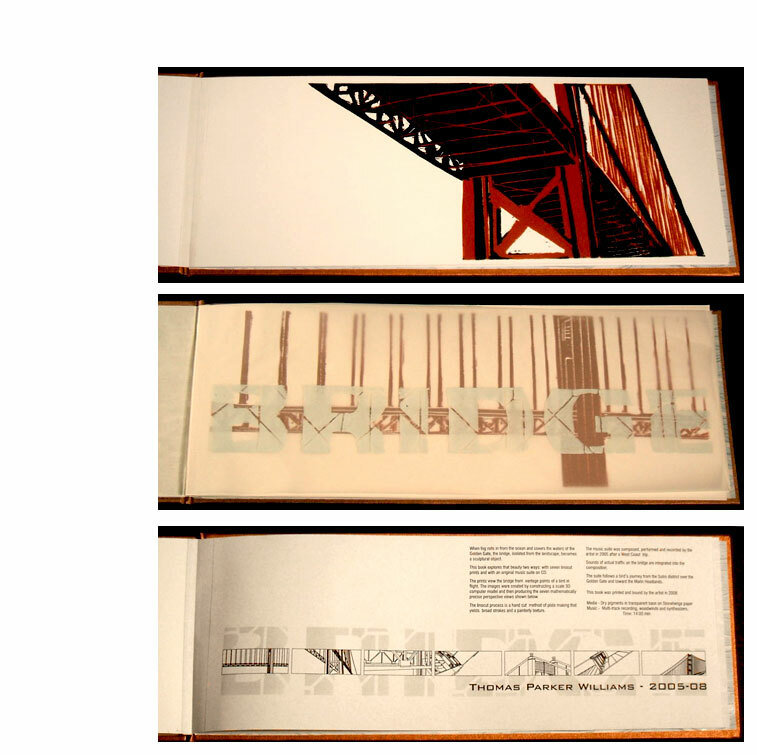 Standard Edition: 8.5 x 11"; 7 leaves including covers. 5 pinhole photograph silver gelatin prints. 2 digitally reproduced ink drawings. Cut paper overlay of bridge over cover. 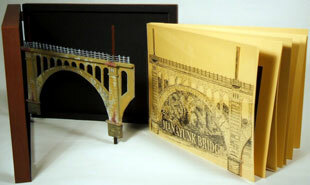 Deluxe Edition: 12" x 9.5" x 2"wood case with clear cover containing 3D relief model of one of the arch sections of the bridge and the book of pinhole photographs. 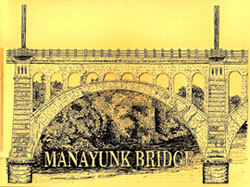 Thomas Parker Williams: "Manayunk Bridge is an exploration of a railroad bridge built in the 1918 in Philadelphia [across the Schuylkill River and adjacent Schuylkill Canal] that has not been used since 1986. The bridge is officially known as the Pencoyd Viaduct." Philadelphia, Pennsylvania: Thomas Parker Williams, 2012. Edition of 5. 5" x 11" x 1" closed, extends to 3.5" x 157.5"; 15 panels. Digital print of original ink drawings on scroll. Housed in viewer constructed of wood and aluminum bound with black Tyvek. Magnet closure at each end. Signed and numbered by the artist. 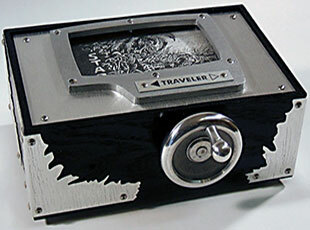 These two digital print versions are based on the original pen and ink unique books by the same name – Traveler No. 1 and Traveler No. 2. Thomas Parker Williams: "The Travelers are book objects with unique drawings that are viewed through the windows on the top panels and are moved by sliding the unfolded drawing through the case. The viewer travels through imaginary landscapes as if in a moving vehicle, viewing an ever changing horizon. "Traveler No. 1: The journey starts in a wooded area, moves over land, mountains, and into the sea, passes an island, and comes to rest on a shore. "Traveler No. 2: The journey starts in a desert oasis, moves over the edge of a canyon, moves down to the river and over a waterfall emerging over mountains and clouds, and comes to rest on an arctic ice shelf. " Philadelphia, Pennsylvania: Thomas Parker Williams, 2011. Edition of 5. 7 x 10 x 1.5”; 9 pages. Six silver gelatin prints . Three painted wire sculptures (wood frames) . Cover of thin gauge galvanized steel with title in wire. Bound with dyed Tyvek. 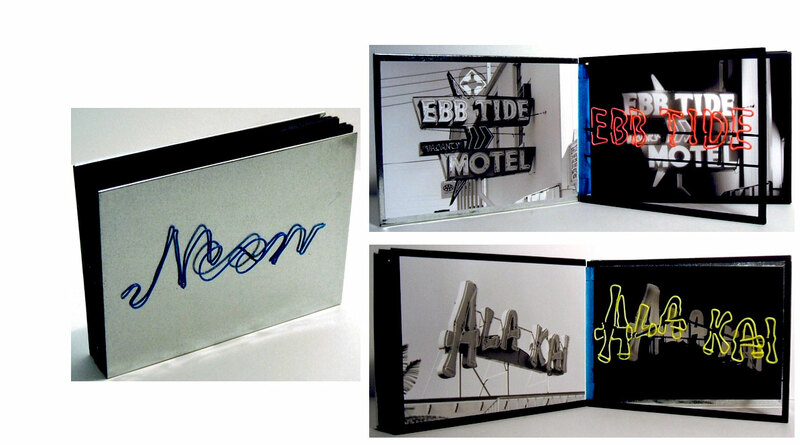 Thomas Parker Williams : "Neon is a study of classic neon signs featuring three 1950s-era motels in Wildwood, a popular beach town in New Jersey. Dozens of these motels (with their ubiquitous neon signs) were built in mid-century, but many are no longer standing. “Neon combines day and night photographs that I took twenty years ago with a 4x5 camera, with wire sculptures that reproduce the neon tubes of each sign. The wire sculptures are painted in fluorescent colors, vibrating between the black and white photographs. "Neon can be opened to display any of the three sets of images or opened in a circular form to display all of the images." Philadelphia, Pennsylvania: Thomas Parker Williams, 2010. 8 x 11.25 x 1.75" closed, opens to 8 x 11.75 x 16"; 72 paper panels. Seven colors, printed double-sided (reduction linocut), cut with scroll saw, mounted on a dyed tyvek 6 x 12" accordion matrix in case that is bound in dyed tyvek and printed with single color linocut front, back, and sides. Magnetic catches secure the structure in the open and closed positions. Signed and numbered by the artist. Thomas Parker Williams: "Mountainside Matrix is a book structure representing the natural complexity of a mountainside forest in autumn. "The basic structure is made up of six, 12-panel parallel accordions tied together at each end and spaced apart to allow for collapsing to a flat form. Additional tie points are added in 20 places to allow for uniform movement when collapsing and extending. Magnetic catches secure the structure in the open and closed positions." Thomas Parker Williams: "Original music and sound (which I composed, performed and recorded) are integral parts [of a number of editions I have produced]. 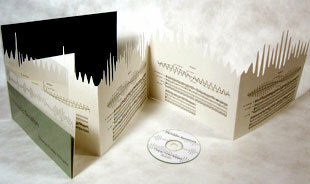 A music CD fits into a holder that is part of the book's design or accompanies the book in its own case.". Philadelphia, Pennsylvania: Luminice Press, 2016. Edition of 25. Two books: Printed with a platen press on Mohawk Superfine Cover smooth paper. Covers of Classic Linen paper. Tyvek hinged accordion binding. Circular panels with 8.5" diameter. Designed, composed, performed, printed, and bound by Thomas Parker Williams. Colophon page laid in, signed, and numbered by the artist. 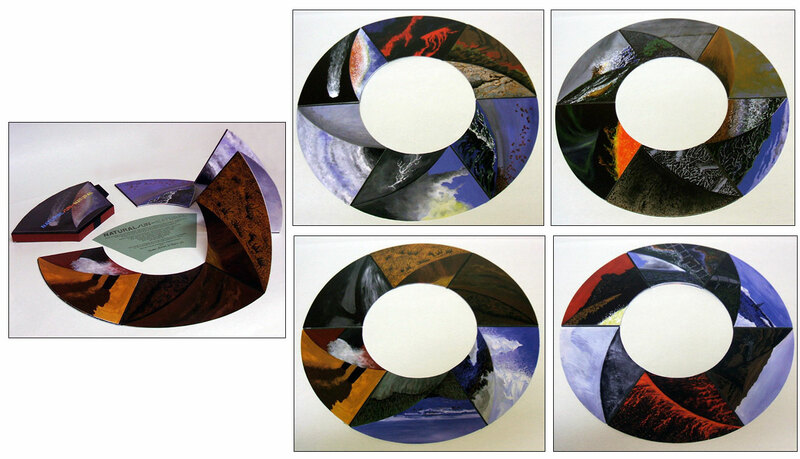 Book one: Six circular panels (8.5" dia.) 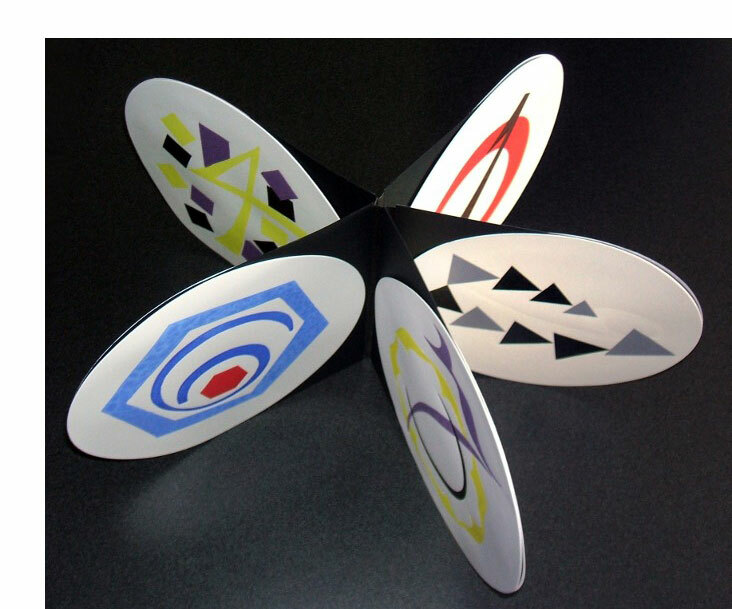 with 4-color illustrations printed with hand-cut polycarbonate plates rotated around a central axis in a different position for each color. Center freehand text and cover printed from polymer plates. Book two: Two circular panels (8.5 in. dia.) 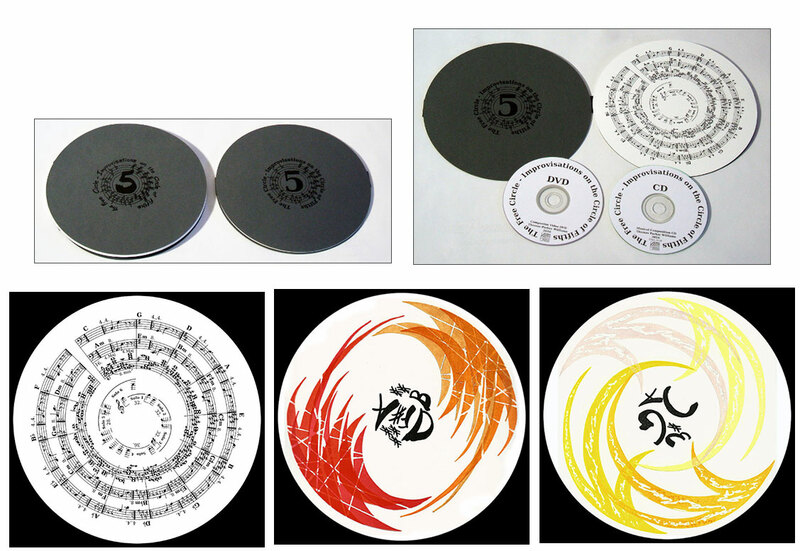 with text and circular staff illustration and cover printed from polymer plates with Music CD and companion video DVD. Thomas Parker Williams: "The Circle of Fifths illustrates the relationships of all of the major and relative minor scales in even-tempered music. All possible key signatures are produced by moving through the circle with each scale starting a perfect fifth or seven semitones above the previous scale. "The musical structure of the composition is illustrated by the chart with the bass clefs indicating the rolling pattern of fifths in the major and minor key signatures and the treble clef indicating the sustained harmony notes that are played serially, in any order, to make each sixteen-bar pattern. "The solos are illustrated as shapes and colors, relating to the instrument choice as well as the lightness or darkness that I assigned to the key signatures. There are colors for each solo demonstrating major and relative minor keys. Each of the six solo panels has a central text area identifying the key signatures of the solos." Philadelphia, Pennsylvania: Thomas Parker Williams, 2016. Edition of 25. 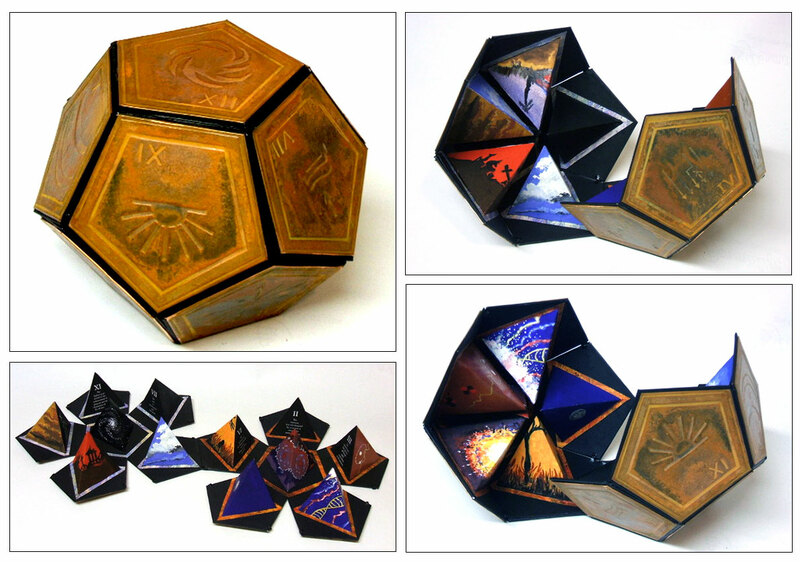 Part One: Six hexagon panels (5 x 6 inches) with color illustrations printed from reduction linocuts. Rear panels are letterpress printed from polymer plates. 8 x 29" extended. Printed on Mohawk Superfine Cover smooth using inks and dry pigments in litho and oil transparent base. 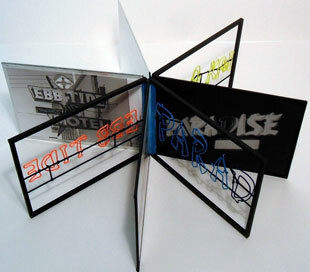 Tyvek hinged accordion binding that opens to display all panels flat (8 x 29 inches) or folded (dimensions variable). 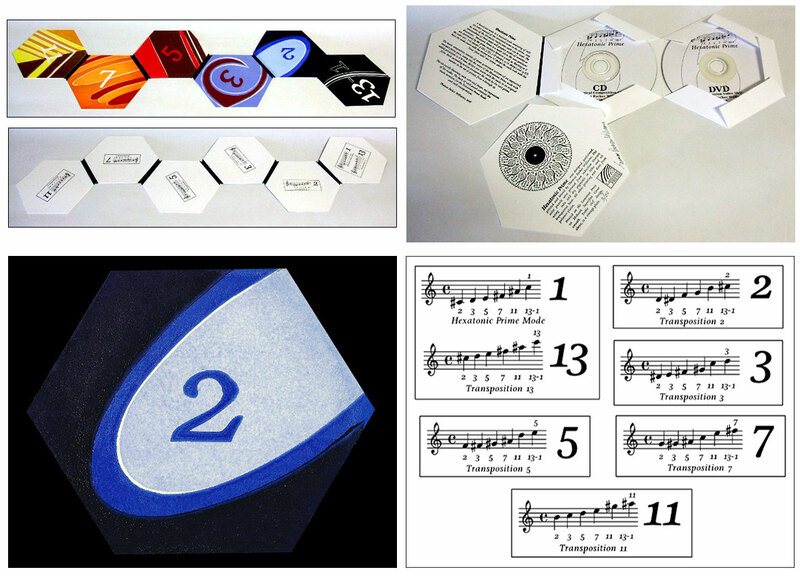 Part Two: Hexagon shaped book with text printed from linocut and polymer plates with Music CD and companion video DVD. Thomas Parker Williams: "A hexatonic mode is a musical scale consisting of only six notes instead of the standard seven to the octave. Any six notes of the chromatic twelve tone scale can be used. The relationships of these notes will produce modes of tonality or dissonance. 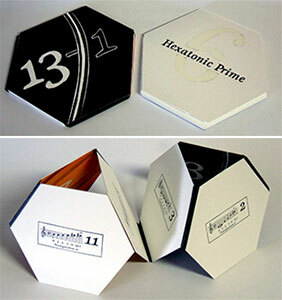 Hexatonic Prime is a mode where the note positions are determined by the prime numbers between 2 and 13. Starting in C the notes are: 2 (C sharp), 3 (D), 5 (E), 7 (F sharp), 11 (A sharp) and 13 (C). Since the mode starts with the second note (C sharp) the scale ends with the Tonic (first note) one octave above. "The music composition consists of seven 31-measure sections of an improvised, two-part piano piece, using only the notes of the Hexatonic Prime mode with added percussion in 6/8 time. Section one starts with the mode in its original form. Each succeeding section transposes the mode by the next prime number in the set of primes from 2 through 13. "The six panels illustrate, with color and shape, my impression of the modes. The back of each panel contains the music notation for the Hexatonic Prime Mode and each transposition." Philadelphia, Pennsylvania: Thomas Parker Williams, 2015. Edition of 20. 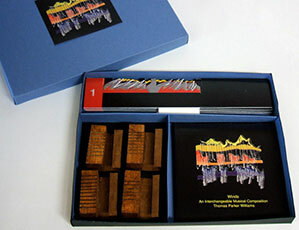 8 x 9.5 x .5" lidded and sectioned paper box containing Music CD, Video DVD, wooden stands, and 21 hand cut digital printed panels. Signed and initialed by the artist. Thomas Parker Williams: "The music for Winds consists of 14 solo musical voices composed, performed and recorded by the artist on an electronic wind instrument. Each voice is represented graphically by a moveable acrylic panel. Musically the 14 voices, individually presented on the CD, may be arranged in many different combinations. 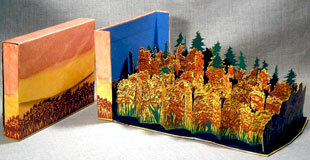 A visual composition can be created illustrating the musical one using the moveable panels. The video illustrates the 14 solo voices and three of many possible compositional arrangements with animation of the moveable panels as each voice appears in the composition. 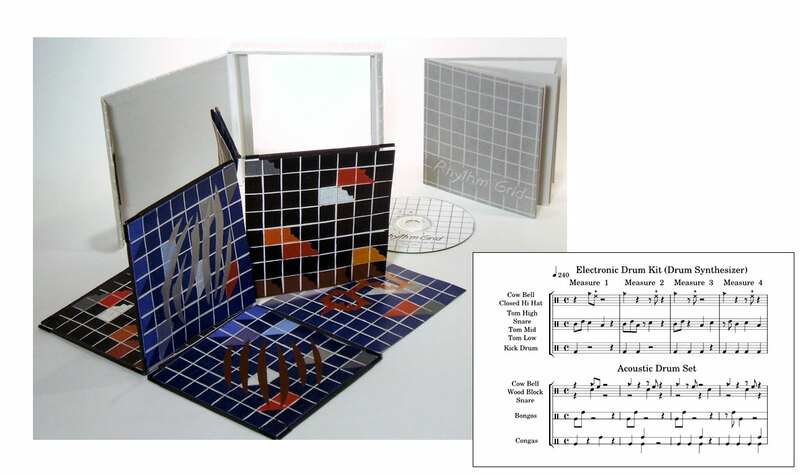 "Users of this book are welcome to make their own musical compositions with the individual voices contained on the CD. Colors on the panels indicate, from dark to light, the position of the voice in the 4-1/2 octave range of the composition. The cut shapes and inscribed lines of each panel indicate the texture and harmonic quality of each voice. " Philadelphia, Pennsylvania: Thomas Parker Williams, 2013. 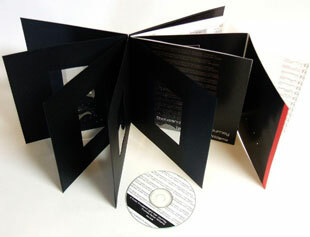 6 x 6 x 1.25" box containing booklet with CD and separate linocut foldout. Booklet: 5.25 x 5.25", 10 pages. Reduction linocut foldout: 5.25 x 5.25"closed, extends to 40"; 16 panels; "L" type wire binding. Box: modified clamshell covered in linocut-printed paper; Tyvek-bound with clear acrylic window; magnet flap closure. Signed and numbered by the artist. The Rhythm Grid booklet contains the musical score, panel legends and the CD with music composed, performed, and recorded by the artist. Thomas Parker Williams: "Rhythm Grid began as an idea for a musical composition featuring only percussion and flute. The idea centered on creating written drum parts using a grid of 16 numbers and simple mathematical formulas. The numbers 1, 2, 3, and 4 were arranged in a grid with the vertical columns designated a, b, c, and d. The seven formulas, in the chart next to the grid, were used to create the seven percussion parts in the Electronic Drum Kit and the Acoustic Drum Set using the numerical values of the horizontal rows corresponding to the letters of the vertical columns. These formulas were used four times to create the four measures shown in the musical transcription. "The Electronic Drum Kit and the Acoustic Drum Set use the same rhythm pattern. The music, based on 4/4 time with eight beats per measure, was written out and first programmed into a drum synthesizer. Then the Acoustic Drum Set was played and recorded by microphones. "The four measures were arranged as shown on the Score to create a 64 bar sequence that was repeated four times for a 256 bar composition. 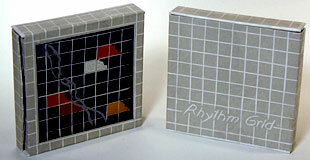 Additional acoustic percussion, noted on the panels are a direct visual interpretation of the rhythm pattern of the measures with overprinted symbols for the improvised instruments. The eight double-sided panels are hinged with an L-shaped wire binding method that allows the panels to be read as a codex or arranged in many other forms." 8 x 8 .375"; 5 letterpress printed maps on Mylar. Digital prints. CD in pocket on interior back cover. Initialed and numbered by the artist. Thomas Parker Williams: "A Three Thousand Light Year Journey explores the concepts of time and space by constructing an accurately scaled 3D computer model of a section of the sky, created by the artist with CAD software. "Using data obtained from www.skybeautiful.com, a very small area of the celestial sphere was defined as Right Ascension between 5 hours and 6 hours (15 degrees on the 360 degree rotation of the Earth) and about 13 degrees above and below the celestial equator. This area, about six-tenths of one percent of the observable sky, contains the constellation Orion. "Ninety stars, down to magnitude 6, were used in the 3 D computer model which is illustrated in two ways: as a view from Earth as well as a 3D view from space. 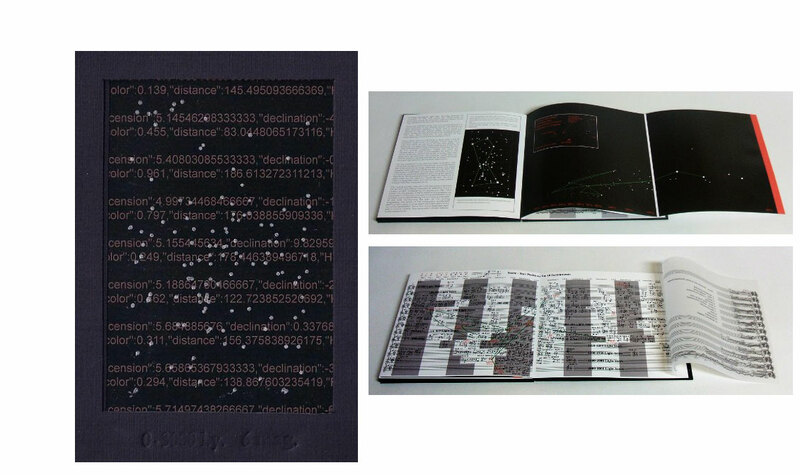 An additional 134 magnitude 6 stars were added to the 90 to make the transparent maps in the front of the books as well as the musical composition. These 224 stars are representative of what could possibly be seen in this sector of the sky without optical aid, on a very dark night away from light pollution. This computer model does not include stars and objects that are farther away than three thousand light years or dimmer than magnitude of 6. "The star positions in the view from Earth illustration, with the familiar borders of Orion the Hunter, are transformed in the three dimensional image. Stars that appear very close together when seen from Earth can be very far apart. The magnitude or brightness of a star seen from Earth is given a numerical value and is called in astronomy the Apparent Magnitude. The actual brightness or Absolute Magnitude is determined by the Apparent Magnitude and the star's distance away from Earth, and can be many times greater in brightness than it appears to us. 6.25 x 8.25"; 14 pages. Letterpress printed covers. Digital prints of original drawings. End papers digital prints of ink drawing. With original sound work on CD in pocket on back pastedown. Initialed and numbered by the artist. Thomas Parker Williams: "Venezia a febbraio is a portrait of Venice in February. "The book contains a sound work, recorded there in 2011, and a series of original drawings, in the style of eighteenth-century Venetian artists executed in pen and brown ink, brown and grey wash.
"The cover is an original design that is letterpress printed. 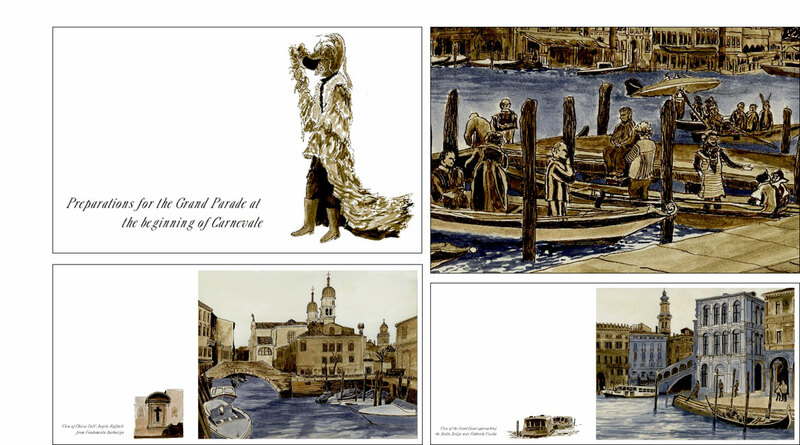 The end papers are original drawings based on Venetian marbled paper." Philadelphia, Pennsylvania: Thomas Parker Williams, 2008. Edition of 18. 5.5 x 15"; 11 leaves. Seven linocut prints. Dry pigments in transparent base on Stonehenge paper. Original music CD: 14 minutes, multi-track recording, woodwinds and synthesizers. Linocut end papers. Hardbound cover. Envelope attached to back pastedown to contain CD. Signed and numbered by the artist. Thomas Parker Williams: " When fog rolls in from the ocean and covers the waters of the Golden Gate, the bridge, isolated from the landscape, becomes a sculptural object. 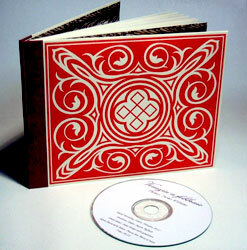 “This book explores that beauty two ways: with seven linocut prints and with an original music suite on CD. 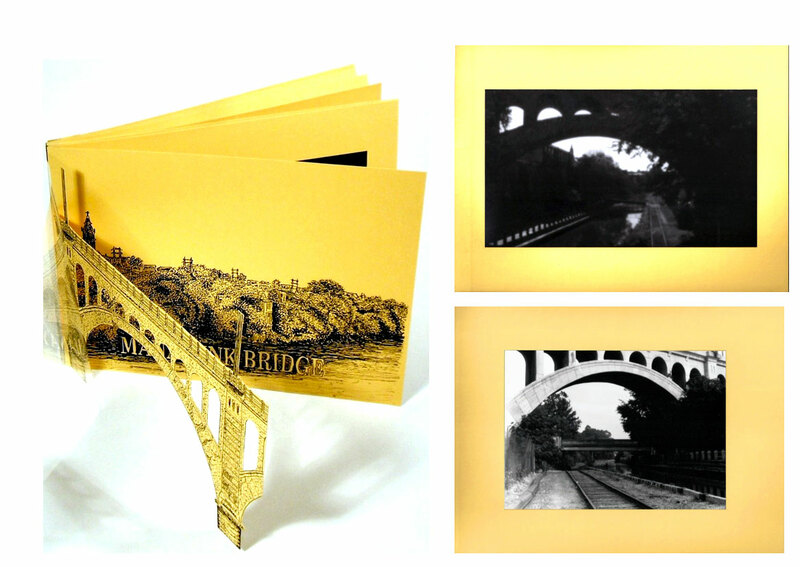 “The prints view the bridge from vantage points of a bird in flight. The images were created by constructing a scale 3D computer model and then producing the seven mathematically precise perspective views shown below. The linocut process is a handcut method of plate making that yields broad strokes and a painterly texture. “The music suite was composed, performed, and recorded by the artist in 2005 after a West Coast trip. The suite follows a birds journey from the Sutro district over the Golden Gate and toward the Marin Headlands. Sounds of actual traffic on the bridge are integrated into the composition." Stephanie Frank Singer, Symbols, strokes and sounds: Thomas Parker Williams: "After reading James Glieck's Chaos, Williams started to think about process-based art. In other words, instead of trying to portray a particular visual scene (product-based art) he wanted to set up a process for creating art without trying to predict or constrain the outcome. He started with mathematics, basing works on the geometric spiral and chaos theory." Philadelphia, Pennsylvania: Thomas Parker Williams, 2014. 8.25 x 8.25" paper box containing 8" diameter volvelle, pamphlet, one sheet sample sheet. Digital prints. Signed and numbered by the artist. Thomas Parker Williams: "In the wake of revelations of American domestic surveillance of private messages I started to think about message encryption. Modern computer technology allows the creation of unbreakable ciphers; however, with enough processing power almost any cipher-text might be broken. For the past fifty years, with the rise of credit debt, we have given up our right to privacy. The Internet is not secure. Personal information is bought, sold and stolen at will. Sophisticated encryption software is available for use in electronic communication; however, using it may bring unwanted attention from the boys deep inside the 'Puzzle Palace.' It seems today that even living in a cabin in the deep woods does not protect you once you communicate with the world at large. "One story from World War Two has always interested me. The German High Command used a device called the Enigma Machine to encode messages sent by radio and teletype. The machine used electro-mechanical rotors that could be re-oriented daily to produce coded messages that the Germans thought unbreakable. The British thought otherwise and successfully broke the German code, providing great military advantage. 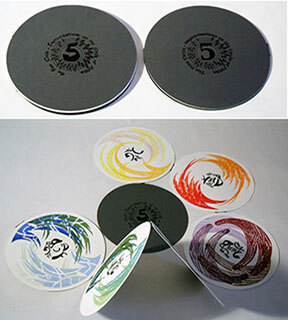 "The Paper Enigma contains three paper rotors, Red, Blue and Yellow, each with ninety divisions. Since this machine is manually operated the rotors are set by hand. Three sets of ninety ciphers each, NUMERIC, ALPHA-NUMERIC and ALPHA-ALPHA are arranged randomly over the three rotors. Three alphabets, sequential, random order and numeric, are arranged over ninety positions that correspond to the ninety positions of the index outer circle. When the red, blue and yellow rotors are aligned with a predefined key the cipher sets that appear in the sliding window can represent the plain-text letter that they correspond to. The person receiving the coded message will align their rotors in the same position as the sender's and decode the message by using the sliding window and the cipher index that gives the rotor and position location of the cipher counter-clockwise from the index mark on each rotor. There are over 700,000 different positions for setting the rotors. Complicated encryption can be produced by using both random and sequential plain-text alphabets and multiple pairs of ciphers. Seven blank positions are provided across the three rotors that can also be used as ciphers in combination with adjacent cipher pairs. "Keys may be transmitted several ways: You can use the index ciphers Red (13), Blue (AN) and Yellow (l9) and align them to index circle positions such as 1302AN30L963 which would mean Red (13) to index circle 02, Blue (AN) to index circle 30 and Yellow (l9) to index circle 63. You can use three ciphers 432067 which would mean align Blue (43) to Red (20) to Yellow (67). 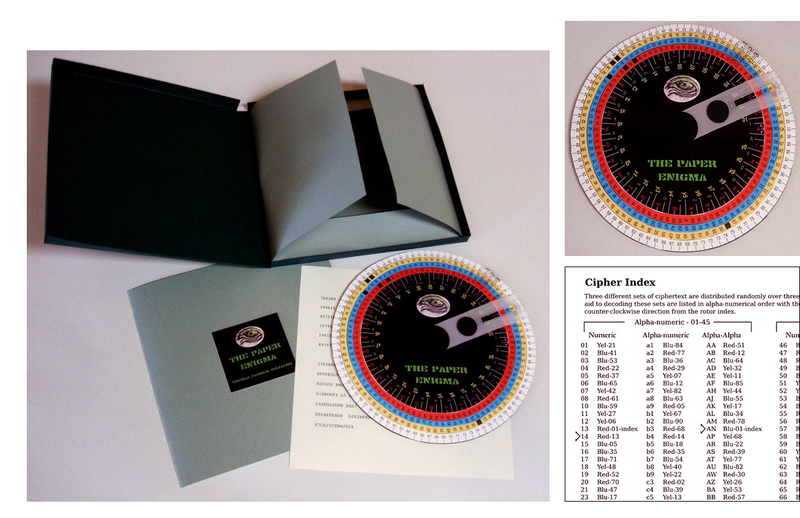 Locations on the rotors for these ciphers are found in the cipher index. "Cipher-text can be arranged many ways, in groups of five letters or numbers, or any other length, or as a continuous stream. The possibilities are endless. 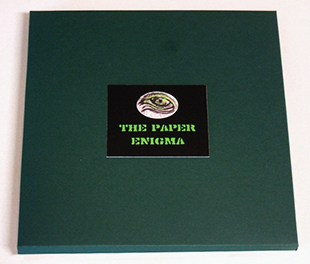 "Although The Paper Enigma can produce cipher-texts that would be very difficult to break manually, it probably could easily be broken by today's Puzzle Palace boys, so be careful, the NSA is watching you." Philadelphia, Pennsylvania: Thomas Parker Williams, 2011. Edition of 40. 7.5 x 8.5 x .5" closed, opens to 22" x 25.5". Reduction linocut print with metal pigments on paper mounted onto Tyvek. Laid in Mylar case. Single triangular sheet for colophon and instructions. Housed in a cream-colored heavy paper envelope. Signed and numbered by the artist. 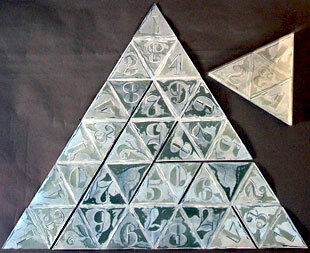 Thomas Parker Williams: "Jasper's 72 Triangles is an artist book inspired by the recent 'Number' reliefs by Jasper Johns. “Starting with the concept of a single number in a discrete area, in this case a double-sided triangle, and then connecting 36 double-sided triangles together, the book-painting becomes dynamic by folding into many different configurations of triangles for display. “The work uses only the numbers of 1, 2, 3, 4, 5, 6, 7, 8, and 0. Adding the displayed numbers together results in a sum that is a multiple of 12 or 36 or 72 in many of the possible triangle combinations. “A folding diagram is provided as an aid to returning the book to its correct folded state to fit into its Mylar case." 15 x 14.5 x 2" closed; 15 x 14.5 x 45" open. Multi-panel cut-paper 3D model. Multi-color reduction linocut print, 10" x 42". Paper-covered hard-bound case. Signed and numbered by the artist. Thomas Parker Williams: "This multi-part artist book constructs a virtual ocean wave by using sequential random numbers and a simple mathematical formula. 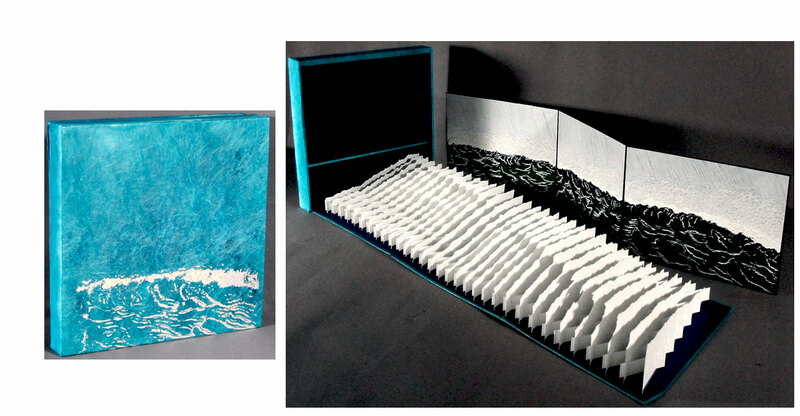 The virtual wave is represented as it would appear in nature from two perspectives: A 3D paper model and a reduction linocut print. 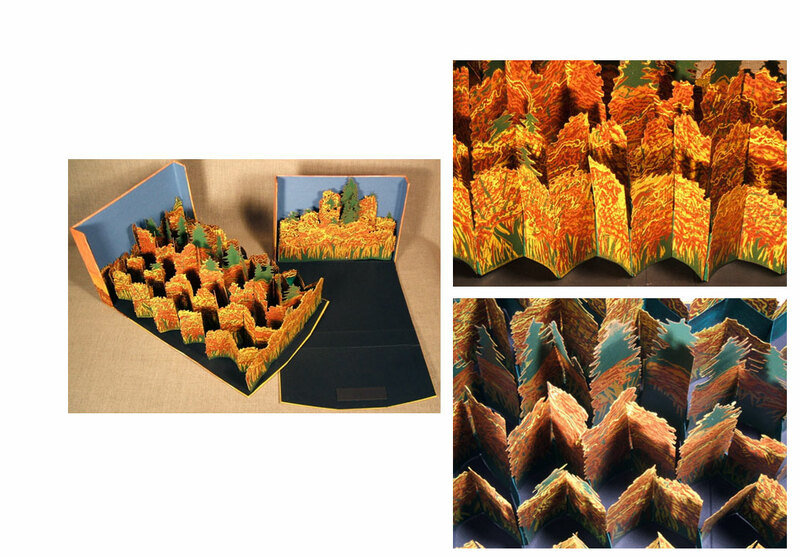 The pull-out three-dimensional paper model has thirty-two sequential paper wave cross sections covering an area of 15" x 40". A 10 x 42" multi-color linocut print is a pictorial representation of the cross sections. "To establish the physical characteristics of this wave, I am using data and formulas from a classic work on wave forecasting developed after World War II. Conditions chosen were: 50-knot wind, typical wave height 40 to 50 feet, typical wave length 700 feet, with a ratio of wave length to height of 15 to 1. The 3D paper model is constructed at a scale of 1=300 or 1" = 25 feet. The linocut print image is based on the 3D model and augmented using written descriptions of actual wind conditions as well as reference photographs from the Beaufort Wind Scale. However, the linocut image does not exist in photographic form. "Deriving the wave shape: All wave forms are sequential objects defined by a series of points moving through space and time creating an oscillating motion and a periodic repetition of the basic wave form. Since ocean waves are basically sinusoidal, I derived the virtual wave by using a sine function with a random number component. This produced an irregular sine wave approximating what might exist in nature . "Creating the sequence of wave cross sections: Using the principles of self-similarity in nature I used a simple feedback function to create a sequence of cross sections of the original wave shape at different relative scales. I used 3D CAD software to draw a 3D computer model of the wave and chose an area of this 3D computer model for the paper model. I printed the thirty-two individual cross sections and modified them, by hand, to produce the slight alterations that actual wind conditions would produce. I then used a saw to cut the sections out of the paper and assemble the model. 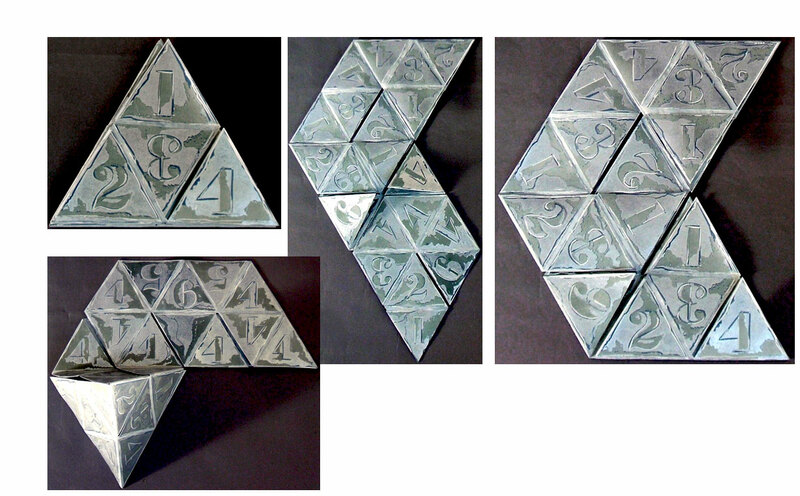 The result: 32 cross sections, in sequence, form a three dimensional representation of the wave. "Illustration: The resulting sections were modified, by hand, to produce the slight alterations that actual wind conditions would produce. The model was then assembled." Philadelphia, Pennsylvania: Thomas Parker Williams, 2000. 7 x 10.25" closed; 6 hinged triple-pane panels. Accordion structure. Wood frames with enamel and ink on Mylar. Housed in 5 x 12 x 8" painted wood box with hinged lid. With artist's notes on calculation. Thomas Parker Williams: "Within a framework of hinged panels, Number Box constructs a series of lines made of polygons arranged on six triple-pane transparent screens. The polygons were derived from a grid of numbers that changed order on every line. The scale of each set of four polygons, 4 sets per line, was determined by applying a simple formula to each set of numbers. "Polygon lines - Note that the orientation of each alternate line is reversed vertically." Philadelphia, Pennsylvania: Thomas Parker Williams, 2012. 8.5 x 11" closed, extends to 44". Digital prints. Cut paper. Original music composition on CD. Initialed and numbered by the artist. Mylar front cover. Envelope on inside back cover for CD. Housed in a cream-colored heavy paper envelope. Thomas Parker Williams: "Periodic Serialism is a musical composition with parts for strings and piano that were derived by using periodic trigonometric functions to determine the pitch and duration of the notes. “Seven mathematical equations were used to produce graphs of the functions and the graphs were overlaid with a standard five-line music staff. Where the staff position intersected the graph, a note was placed. The resulting diagram was used to create the sheet music. “In the performance and recording of the music by the artist, additional improvised parts were added to complete the musical composition. 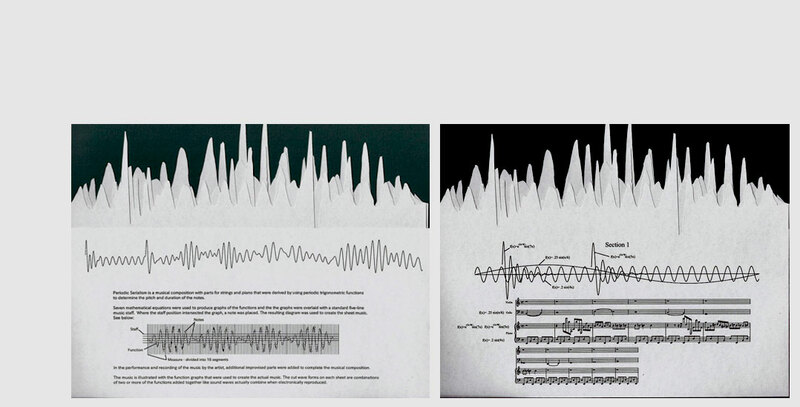 “The music is illustrated with the function graphs that were used to create the actual music. The cut wave forms on each sheet are combinations of two or more of the functions added together like sound waves actually combine when electronically reproduced." 6.75" (9.25" deep including hand wheel) x 10.25" wide x 4.25" high. Original scroll ink drawings 3.5" by 120". Materials: Tyvek, wood and aluminum, mechanical reel system, and hand wheel. Housed in painted wooden box with lid, hinged with tyvek. Signed and dated by the artist on the inside of the box lid. This is the second in the Traveler box series. Thomas Parker Williams: "The Travelers are book objects with unique scroll drawings that are viewed through the windows on the top panels and move as the hand wheels are turned. The viewer travels through imaginary landscapes as if in a moving vehicle, viewing an ever changing horizon. “If desired, both journeys can be viewed in reverse. “The continuous images for both Travelers were drawn directly on the scrolls without preparatory studies or photographic reference. “Traveler No. 2: The journey starts in a desert oasis, moves over the edge of a canyon, moves down to the river and over a waterfall emerging over mountains and clouds, and comes to rest on an Arctic ice shelf."